Taco is running a $25 rebate to contractors on many of their products now until December 15, 2015. Contractors who register for the program between 5/18/15 and 8/20/15 will earn 300 Bonus Bucks and a chance to win e-cards and other great merchandise! Thanks for coming out and spending your time with us! Please see our Training page for links to the Spring 2015 Webinars that are now recorded for you to view whenever you need them. will be sent soon and will also be posted on our website. An Alaskan contractor helps families with heat for the holidays. Proctor Sales and Weil McLain were happy to help this year. Please see the inspiring article and video about how a boiler can change a family's life. Weil-McLain is announcing a rebate promotion that will reward Contractors for purchasing any WM97+® Boiler as well as an additional rebate when purchasing with an AquaLogic® Companion Water Heater or Aqua Plus® Indirect-Fired Water Heater. The promotion period runs from June 2, 2014 through August 31, 2014. Laars is now active with their social media network. Follow them on Facebook, YouTube, and Linkedin to keep up to date on customer center activities, new R&D lab, new product introductions and much more. There are educational videos about Laars products and training. Its a great way to keep in the know and to spread the word to others. This exciting and informational class is filling fast. Please click here to be directed to our registration page. Proctor Sales' service division has launched their own website at www.combustionandcontrol.com. Three sessions, each presented twice, are planned for the spring semester. All sessions are held at the Taco's state-of-the-art Innovation & Development Center at Taco headquarters in Cranston, RI. Each session also includes a Taco factory tour. Participants in each session can earn up to four professional development hours (PDH's) in these full-day seminars. The new 3.8 version of Humid-A-ware™ has just been released! 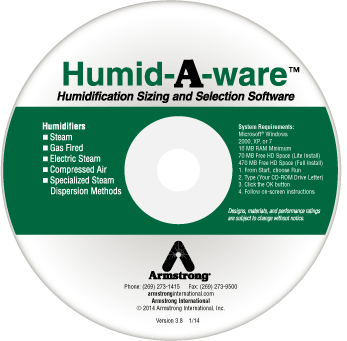 Humid-A-ware™ helps you take the guesswork out of sizing and specifying industrial and commercial humidifiers. Download the latest version now. Are you a contractor with a 2014 Weil McLain Calendar? If so, at the bottom of January 2014 there is a yellow starburst that has information to qualify you for a free Weil-McLain baseball cap! Visit Weil McLain's Contractor Promotions page to download the redemption form, fill it out, include original calendar logo clipping and mail it in. There is no purchase necessary.